Oh my fluffin God, Big tunes 4 real. Anyone that can pull off Aero Smiths “Stay Awake” track and do it better, is damn godly in my eyes..
Much respect for that tune on its own, and the other 13 songs on the album are just an added bonus. Then theres “I had a Dream” such a sweet track with Gyptians – serious times riddim accompanying it. Theres also another cover of a tune called ” if you’re not the one”. I cant go without mentioning “Mamas Blessing” in which he gives copious ammounts of love, respect and thanks to his Mum, Such a feel nice track. 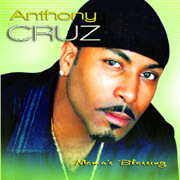 Big up the prosperous Anthony Cruz, advancing in the pursuit of anything desirable, and much love coming your way from bigupradio ! !